My name is Kathy, aka Kat, and that's me on the left. Well, OK -- that's me after Glamour Shots finished with me. I looked like that once. Not once upon a time ... just once. 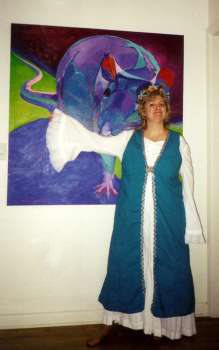 That's also me on the right, all dressed up to go to a Renaissance festival in Florida. I was visiting my friend Tian Ning, and that magnificent painting behind me is the genius of her sister. I made the costume myself (surely you didn't think I paid actual money for it?). 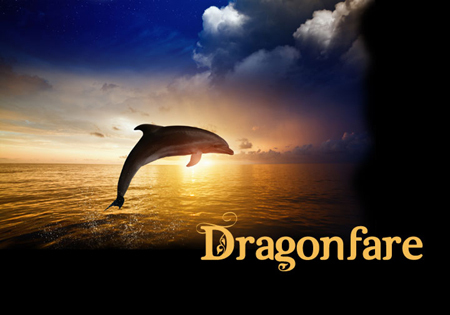 Why "Dragonfare"? My mom suggested it as a good name once, long ago. I still like it. I like writing stories. I like it so much that I've inflicted it upon the world by publishing a couple of books, in the hopes that someone might actually want to buy them. 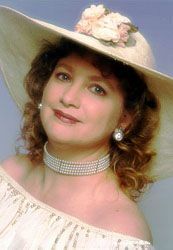 If you want to take a peek at them, check out my sites, kathytrueman.com and catherinedove.com, where you can see samples, the covers, and details. I'm blissfully, joyfully retired. I'm a baby-boomer, born in the early 1950s. I'm a lucky Sagittarian, and happy about it! I live in rural Texas, "down the road apiece" from Dallas, in a 100-year-old house on about 4 acres. I live with my best friend of almost 50 years, and between us we have no husbands and no kids, but a lot of animals -- horses, dogs, cats, and birds. We call the place "The Critters Club" (can't imagine why...). As soon as I moved to the country, I discovered that I never, ever want to live in a city again. I'm an Army brat, and I've lived in Michigan, Japan, Arizona, Massachusetts, Virginia, Germany, Maryland, New Jersey, and now Texas. We moved every three years when I was growing up, and about every three years I still get the urge to move again. But nowadays when I feel that urge, I just rearrange the furniture. Somehow, despite constant partying, I managed to graduate with a BA in English from Frostburg State College (now a university) in beautiful western Maryland. I was supposed to teach high school English, but to the great good fortune of students everywhere, I turned out to be a bookkeeper and secretary instead. I had a warm, creative mom, and I still have my brilliant, hardworking dad. I also have 3 brothers, a sister, and a bunch of nieces and nephews who are all beautiful, talented, and wonderful. Sort of. Most of my family has managed to settle in Florida, where I never get to see them. They probably prefer it that way. Writing, reading, watching movies and TV shows, petting my critters, playing Wizard 101. I read fantasy, mysteries, some romance, and a lot of nonfiction. Actually, this list could go on for a long time... my house groans under the weight of my bookshelves. But the books I'd take with me to a desert island are: The Lord of the Rings (J.R.R. Tolkien), The Heaven Tree (Edith Pargeter), The Reluctant Widow (Georgette Heyer), and Until the Sun Falls (Cecilia Holland). Another long, long list! I especially love animated films, fantasy, musicals, Shakespeare and Austen films, romantic comedy, monster movies, westerns, and action films. In fact, really, the only movies I don't like are "artsy", slasher, and excessively depressing or vulgar films. My all-time absolute favorite film is Star Wars (you can call it "A New Hope" all you want, but to my generation, who saw it on its original release, it is and always will be Star Wars). My favorite guilty pleasure is Beastmaster. I don't watch much TV (see above about the advertisements), so all I see on "live" TV is football and the occasional NCIS. But on DVD/BR, in no particular order, I enjoy Game of Thrones, Deadwood, Gotham, Star Trek (classic), Firefly, the Cadfael mysteries (especially the first season), Supernatural, The Man from U.N.C.L.E., The Young Riders, V, Airwolf, The Equalizer, NCIS, Murder She Wrote, Remington Steele (except the last season), Numb3rs... and many more. Yes, there aren't a lot of contemporary shows on that list, I know. This gets a section of its own because so much of my attention, and my biggest website (now sadly defunct because it got too big), are devoted to my lifelong love for animation. My favorite animated movies include Mulan, The Secret of NIMH, How to Train Your Dragon, Ice Age, The Iron Giant, The Little Mermaid, Lady and the Tramp, The Emperor's New Groove, and anything by Miyazaki, but truly, it's a lot easier to list animated movies I don't like, as that list is very short. My favorite animated TV shows are almost all anime: Cowboy Bebop, Rurouni Kenshin, Fullmetal Alchemist, Samurai Champloo, .hack//SIGN, and Gundam Wing, The exception is Avatar. Guilty pleasure? The Tinkerbell series. Movie soundtracks (the real ones, not those hodge-podge collections of pop songs), classical, hard rock, "oldies" rock n roll, and a little bit of country. For a sampling only, my favorite composers are John Williams and Basil Poledouris; favorite oldies/rockers are Billy Joel, the Rolling Stones, the Monkees, the Who, Jethro Tull, Led Zeppelin, and Bon Jovi; favorite classicals are Tchaikovsky, Beethoven, and Rossini; and favorite country singers are Waylon Jennings and Johnny Cash. Chocolate, turkey, watermelon, chocolate, brie and cheddar cheese, chocolate, walnuts and almonds, chocolate, and avocados. Oh, and did I mention chocolate? Beer (in all its stronger varieties), Diet Coke, wine, vodka gimlets, coffee, and tea. Does anyone really read all this stuff?